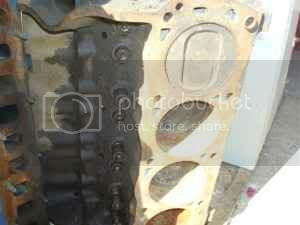 Buying a 351W pulled short block from a 1993 F250, oil pan, oil pump, water pump and balancer included, stock bores. The price is right so I will just go ahead and buy it, but what can I expect to get? -2 or 4 bolt mains? No 4-bolt 5.8 Ws, all 2. Block is roller "capable", notice the holes in the lifter valley. Stock roller parts (retaining spider) will bolt right in. Block # is on flat pad above starter mount. I just heard back from the seller, he listed the price "wrong" he now wants $250 for it "as is"
I think that is a bit too much for an unknown condition block - is it? 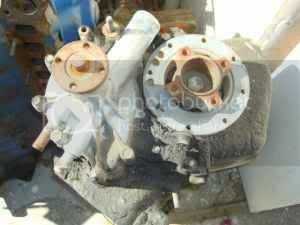 Buying a used engine's a crapshoot whatever the price & nothing but a magnaflux check will say for sure. $250 for a re-buildable 5.8 core is OK, not great. I personaly don't care to buy a core that has had its heads off for a significant amount of time as that one appears to been. got my new tires. What ya'll think? ok. bought my front&rear shocks for my 93..now to install..any tips or tricks? Quick Reply: What can I expect to get?